Zombieland, the latest studio album by Germans MEGAHERZ, is still haunting our auditory canals, whilst the fivepiece has already been busy working on fresh shenanigans: „Look forward to the new MEGAHERZ shredfest!“, the band announces its EP Erdwärts! There are four new and very varied songs on this EP: two of them stand for pure riff-laden heaviness, then there is a midtempo one and a rather slow and broody track that will be the talk of the town. Lyricwise, fear is at the heart of it all: fear of the unknown and fear of a world that seems chaotic and out of control (‘Schwarzer Mann‘). It`s time to stop hiding and face those fears! ‘Glorreiche Zeiten` (‘Glorious times‘) on the other hand wishes strength to dreamers aiming to fulfil their biggest dreams. ‘Einsam‘ (‘Lonely‘) tells the story of the demise of a relationship with a twist: the one who leaves seems rather gleeful! 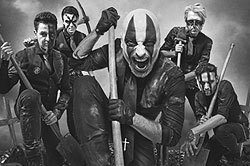 On top of it and just like with Götterdämmerung and Zombieland, two MEGAHERZ classics got re-recorded – fans will embrace the new versions of faves ‘Teufel‘ and ‘Jordan‘. A wondrous mix and a mighty appetizer for the MEGAHERZ German tour in January 2016 – and something to heal the pain of waiting for the next album.